The idea of fear can be paralyzing. Getting hung up on the fear of failure can be paralyzing up to the point where it can be the reason why goals or objectives never get met. The concept of fear is the theme behind Night Argent’s latest EP. 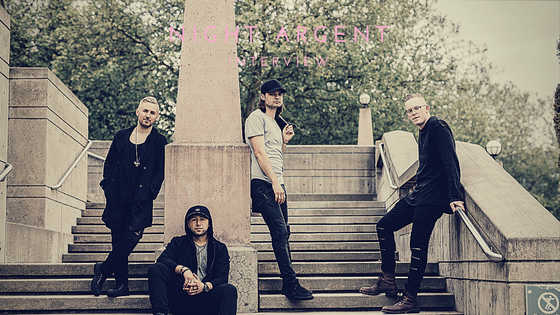 Night Argent has played together for a few years and has spent that time really honing in on their skills and getting to know one another as musicians. During that time, they competed in the Ernie Ball International Battle of the Bands and took home the grand prize out of 15,000 bands. After winning the 2015 Battle of the Bands competition, Night Argent received an once-in-a-lifetime opportunity by working with none other than John Feldmann. Feldmann has done production work and co-writing with the likes of Good Charlotte, All Time Low, Blink-182 and a list of many more as well as work with his own band, Goldfinger. Despite the initial nerves of working with outside forces, Feldmann and his team created a comfortable work environment for the band. Manhattan said there was a genuine sense of comradery in which Feldmann took the time to really get to know the band individually and as a whole. Through this experience, as well as co-writing and co-producing with Steven Solomon, The Fear was born. Although fear can be paralyzing, the only way to defeat it is to push for that goal or objective that is causing that fear. For Night Argent, their concepts of fear and conquering it shine through in the most positive ways.